Bartolomeo speaking to an unconscious Gambia. 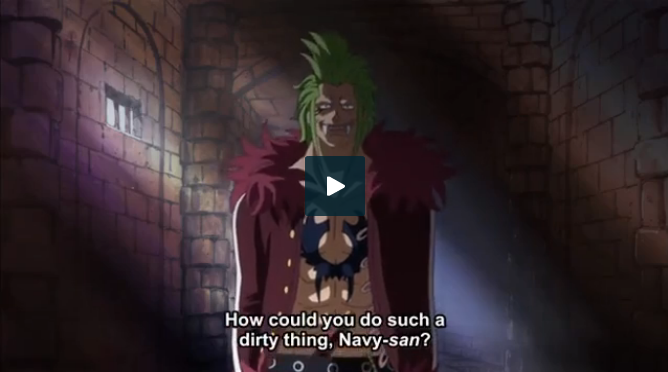 The confrontation between Bartolomeo and Maynard. Bartolomeo crosses his fingers, hinting at his ability. When the group on the Sunny heard a strange noise, Brook and Chopper investigate and see the men's dormitory turned into art. I thought the episode was pretty good. A lot of moving around to different scenes, but at least something happened in each of them. CP-0 shows up, I wonder what they are doing in Dressrosa. Zoro finally gets his sword back , someone is on the thousand sunny, and Block B is about to start. I like this episode , i look forward to the next episode and my One Piece cosplay costume .